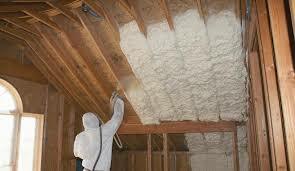 Spray foam insulation is an ideal choice for insulating a home. Unlike other types of home insulation products, polyurethane spray foam insulation leaves no gaps or cracks for air infiltration. It also provides a higher R-value (resistance to heat flow) per inch than any other type of house insulation product. There are two main types of spray foam insulation, open cell and closed cell. Closed cell spray foam insulation provides a higher R-value, however it is more expensive than open cell. Closed cell foam insulation is commonly used in insulating homes and should always be used over open cell foam in below grade applications as it is a natural vapor barrier. Closed cell foam insulation is also ideal for narrower width framing. Open cell spray foam insulation typically requires trimming after installation whereas closed cell spray foam insulation does not. When installed properly spray foam insulation can yield up to a third more in energy cost savings compared to other types of home insulation. Also, since spray foam insulation adheres well to anything it is sprayed on to, and fills every nook and cranny that it is sprayed into, insect infiltration is also mitigated. In addition, spray foam insulation retains its R-value over time, unlike rolled or batt fiberglass insulation, and it is also an excellent sound insulator. Also spray foam insulation, and in particular closed cell spray foam insulation, helps improve the structural integrity of walls, floors and ceilings. Consequently a home is less susceptible to sheering and racking caused by high winds. Though spray foam insulation has many benefits it is more expensive to install than rolled or batt fiberglass insulation. It is also messy and if not installed correctly can cause walls to swell or buckle, and doors and windows to not function properly. Consequently when insulating an entire home or a large room forgo the thought of using diy spray foam insulation kits, and hire a professional who has the experience and equipment to install it correctly. This said, for small projects, such as insulating around interior door and window frames, the small cans of spray foam insulation are perfect for the diy homeowner. I have used them around the interior of my garage doors and windows and they work fabulously in stopping cold air drafts. Just make sure to keep the tube and can moving as you work your way around the door and window frame. Also, go lightly on the nozzle button. Otherwise you’ll end up with a lot of foam expanding out beyond the frames, and you’ll create a huge and sticky mess. Moreover, make sure to select a spray foam insulation type that remains flexible after curing so that the door and windows still open and close easily. The small spray foam insulation cans are also great for insulating around electrical boxes, and plumbing and wiring holes in the wall studding. The gaps in home insulation around these particular areas are often major sources of air leaks. 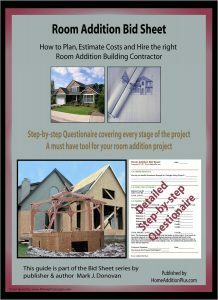 For help on building a home addition, see HomeAdditionPlus.com’s Home Addition Bid Sheets. Our Home Addition Bid Sheets provide you with the knowledge and information on how to plan a home addition project, and what to look for when hiring contractors. They also include detailed cost breakdown tables and spreadsheets for estimating your own new home addition building costs.